For ither uises, see Attica (disambiguation). Attica (Greek: Αττική, Attikí; IPA: [atiˈci]) is an admeenistrative region in Greece, containin Athens, the caipital o Greece. The history o Attica is tichtly linkit wi that o Athens, which frae the Classical period onwards, wis ane o the maist important ceeties in the auncient warld. Locatit in the sooth o the kintra, Attica covers aboot 3,808 square kilometres. In addition tae Athens, it contains athin its aurie the ceeties o Piraeus, Eleusis, Megara, Laurium, an Marathon, as well as a sma pairt o the Peloponnese peninsulae an the islands o Salamis, Aegina, Poros, Hydra, Spetses, Kythira, an Antikythera. Aboot 3,750,000 fowk live in the region, o which mair than 95% are inhabitants o the Athens metropolitan aurie. The Temple o Poseidon (c.440 B.C.) at Cape Sounion, the soothmaist point o Attica. Durin antiquity, the Athenians boastit o being 'autochthonic', which is tae say that they wur the oreeginal inhabitants o the aurie, an haed no muivit tae Attica frae anither place. The traditions current in the classical period recoontit that, durin the Greek Daurk ages, Attica haed become the refuge o the Ionians, a tribe frae the Northren Peloponnese. Supposedly, the Ionians haed been forcit oot o their hameland bi the Achaeans, who haed in turn been forced oot o their hameland bi the Dorian invasion. Supposedly, the Ionians amalgamatit wi the auncient Atticans, who wur efterwards considered thairsels pairt o the Ionian tribe, an spoke the Ionian dialect. Mony Ionians later depairtit frae Attica tae colonise the Aegean coast o Asie Minor, creatin the twal ceeties o Ionia. Till the 6t century BC, airistocratic families livit an independent life in the suburbs. Anerlie efter Peisistratus's tyranny an the reforms implementit bi Cleisthenes did the local communities lose their unthirldom an succumb tae the central govrenment in Athens. As a result o these reforms, Attica wis dividit intae approximately a hunder municipalities "dēmoi" (δήμοι) an intae three big lairge sectors: the ceety (άστυ), which comprised the auries o central Athens, Ymittos, Aegaleo an the fuit o Munt Parnes, the coast (παράλια), that includit the auries frae Eleusis tae Cape Sounion an the aurie aroond the ceety (εσωτερικό-μεσογαία), inhabitit bi fowk livin on the north o Munt Parnitha, Pentelicum an the aurie surroondin the muntain o Hymettus. The "dēmoi" wur in their turn dividit intae "trittyes" (τριττύες). A “trittya” frae each o the abuin mentioned sectors constitutit a tribe. Consequently, Attica consistit o ten tribes. Durin the Classical period, Athens wis fortifeed tae the north bi the fortress o Eleutherae, which is preservit in an amaist perfect condition. Ither fortresses are those o Oenoe, Decelea an Aphidnae. On the coast, Athens wis fortifeed bi the waws at Rhamnus, Thoricus, Sounion, Anavyssos, Piraeus an Eleusis, in order tae protect the mines at Laurium. Even though airchaeological remains are foond in nearly the whole aurie o Attica, the maist important o them aw are the remains foond in Eleusis. The wirship o the goddess Demeter an Cora, derivin frae the Mycenaean period, continued till the late years o antiquity. Mony ither types o wirship can be tracit back tae the Prehistoric years. For example, the worship o Pan an the Nymphs wis common in mony auries o Attica such as Marathon, Parnes an Ymittos. The god o wine, Dionysus, wis worshipped mainly in the aurie o Icaria, nouadays the suburb o Dionysus. Iphigeneia an Artemis wur worshippit in Brauron, Artemis in Rafina, Athena on Sounion, Aphrodite on Iera Odos an Apollo in Daphne. Efter the period o antiquity, Attica came unner Roman, Byzantine, Venetian an Ottoman rule. Durin the Byzantine period, Athens wis invadit bi the Goths unner the commands o Alaric in 396 AD. Attica's population diminished in comparison tae the neighborin aurie o Boeotia. The steids o historical interest date back tae the 11t an 12t century, when Attica wis unner the rule o the Franks. The great monastery o Dafni that wis built unner Justinian's rule is an isolatit case that does no signify a widespread development o Attica durin the Byzantine period. On the ither haund, the biggins built durin the 11t an 12t century show a greater flourishment, that continued durin the rule o the Franks, who did no impose a strict rule. Durin the Ottoman rule, Athens enjoyed some richts. Housomeivver, that wis no the case for the veelages o Attica. Great auries wur possessed bi the Turks, who terrorized the population wi the help o spachides (σπαχήδες, cavalry). The monasteries o Attica played a crucial role in preservin the Greek element o the veelages. In spite o its conquerors, Attica managed tae maintain its traditions. This fact is pruiven bi the preservation o the auncient toponyms such as Oropos, Dionysus, Eleusis an Marathon. Durin the Greek War o Unthirldom, the peasants o Attica wur the first tae revolt (Aprile 1821) an they occupeed Athens an seized the Acropolis, that wis haundit ower tae the Greeks in Juin 1822. Attica haes, syne 1829, belangit tae the independent Greek state. Frae 1834, Athens wis refoondit an made the new Greek caipital (muivit frae Nauplia in Argolis), an Greek-speakin fowk gradually began tae repopulate Attica. The maist dramatic surge came wi Greek refugees frae Anatolie follaein the population exchynges atween Greece an Turkey unner the Treaty o Lausanne. The day, hintle o Attica is occupeed bi the Athens urban aurie. The modren Greek region o Attica includes classic Attica as well as the Saronic Islands, a sma pairt o the Peloponnese aroond Troezen, an the Ionian Island o Cythera. Panoramic view o the wastren pairt o the ceety an the port o Piraeus (region o Attica) in Greece. Attica is a triangular peninsulae juttin intae the Aegean Sea. It is naturally dividit tae the north frae Boeotia bi the 10 mi (16 km) lang Kithairon muntain range. Tae the wast it is bordered bi the sea an canal o Corinth. The Saronic Gulf lees tae the sooth an the island o Euboea lees aff the north an eastren coasts. Mountains separate the peninsulae intae the plains o Pedias, Mesogaia, an Thriasion. The muntains include Hymettus, the eastren portion o the Geraneia, Parnitha, Aigaleo an the Penteli muntains. Fower muntains, Aigaleo, Parnitha, Penteli an Hymettus (clockwise frae the soothwast) delineate the hilly plain on which the Athens-Piraeus metroplex nou spreads. The plain o Mesogaía, nouadays cried Mesógeia, lees tae the east o Munt Hymettus an is bund tae the north bi the fuithills o Munt Penteli, tae the east bi the Euboean Gulf an Munt Myrrhinous (modern Merenta), an tae the sooth bi the muntains o Laurium (modren Lavrio). Athens' watter reservoir, Lake Marathon, is an airtificial lake creatit bi dammin in 1920. Pine an fir forests cover the aurie aroond Parnitha. Hymettus, Penteli, Myrrhinous an Laurium are forestit wi pine trees, whereas the rest are covered bi bushery. The Cephisus River is the langest river an Parnetha or Parnitha is the heichest muntain in Attica. The prefectur an aw haes pairklands in the Hymettus, Penteli an the Parnitha muntains an the soothren pairt o the peninsulae. Accordin tae Plato, Attica's auncient bundaries wur fixed bi the Isthmus, an in the direction o the continent they extendit as far as the heights o Cithaeron an Parnes. The bundary line came doun in the direction o the sea, haein the destrict o Oropus on the richt, an wi the river Asopus as the limit on the left. The offeecial European temperatur record accordin tae the Warld Meteorological Organisation wis 48.0°C and it was recorded in Eleusina and Tatoi in 1977, by the use of minimum-maximum thermometers. The Attica region wis established in the 1987 admeenistrative reform, an till 2010 comprised the 4 prefecturs o Athens, East Attica, Piraeus an Wast Attica. The region's govrenor is, syne 1 Januar 2011, Ioannis Sgouros, who wis electit in the November 2010 local admeenistration elections for the Panhellenic Socialist Muivement. Egaleo Ring (number 65), opened in 2004, still unner construction in its soothren pairt. 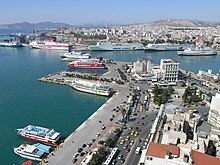 Numerous ferry lines, baith normal ferries an the "flyin dolphins" (fast sea vessels), connect the port o Piraeus wi the islands o the region. ↑ "Monthly bulletins", N.O.A, web: . This page wis last eeditit on 14 August 2013, at 20:26.